As many of you know, in August my wife gave birth to a beautiful, happy, healthy baby girl. Her name is Fiona, she’s the cutest thing in the world, and I’m in love. She went to IKEA at 2-weeks (mistake! ), attended her first A’s game at 4-weeks, sat at her first bar at 6-weeks, enjoyed her first spa day at 8-weeks, and danced at her first wedding at 10-weeks. We made the decision to not share her photos on social media, but trust me, she’s adorbs . . . wait, did I just say adorbs in public? As many of you also know, the lovely Jessica Merchant of How Sweet Eats is due to have a baby in a few weeks too!! 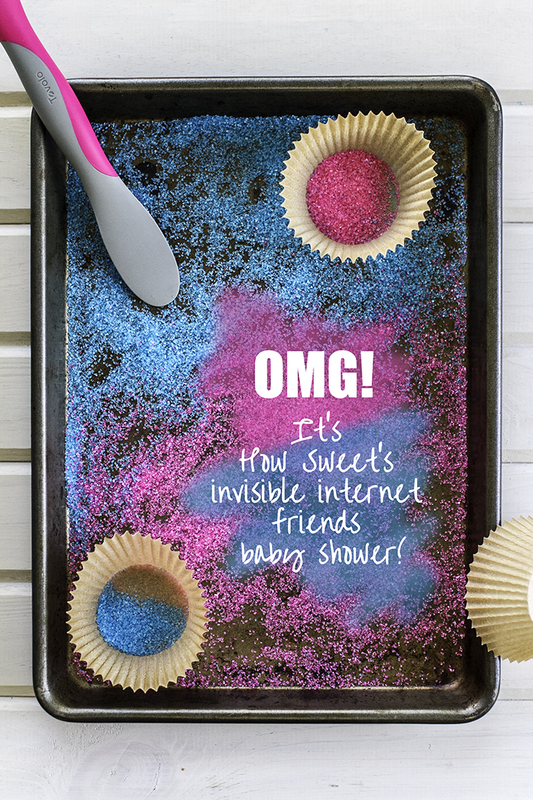 Of course Bev and Ashley, being the awesome friends that they are, organized this little virtual baby shower. Not just any baby shower, but rather an over the top, trashed up, neon, larger than life spread of tacos, pizza, burgers, salads, dessert, and of course cocktails. So please join me in celebrating this wonderful moment . . . Jessica, this one’s for you! I knew immediately that my cocktail of choice would have to include bacon. The next step in this logic was to use a technique that I’ve tried only once before: fat-washing! I mean, what could be more indulgent than that?!! The idea is to infuse the flavors of a tasty fat (in this case bacon) into an alcohol. The alcohol is then put into the freezer, where the fat will solidify and but alcohol will not. Gotta love science! The fat is skimmed and strained (think gravy) and you’re left with fat-washed booze, perfect for any virtual baby shower. It’s really that easy!! Let’s begin . . .
Start by rendering some bacon fat. That’s right, this cocktail involves COOKING BACON! Once the bacon has finished cooking, carefully strain the bacon fat through a fine mesh strainer – preferably one that won’t melt when you pour hot bacon fat through it. Transfer the pisco to a large freezer-safe widemouth jar. This is necessary in order to remove the solidified bacon fat later. Next, strain the warm bacon fat into the pisco, and give it a good stir. It is important to let the bacon fat cool down a bit for safety reasons. However, if it cools down to room temperature it will solidify, in which case simply heat it up again. Once you’ve added the bacon fat, place the pisco in the freezer for 24 hours. This will solidify the bacon fat, thereby separating it from the pisco, which does not freeze. Remove the pisco from the freezer and skim the solidified bacon fat off the top. Pour the pisco through a fine mesh strainer to remove any remaining particles and you’re done! 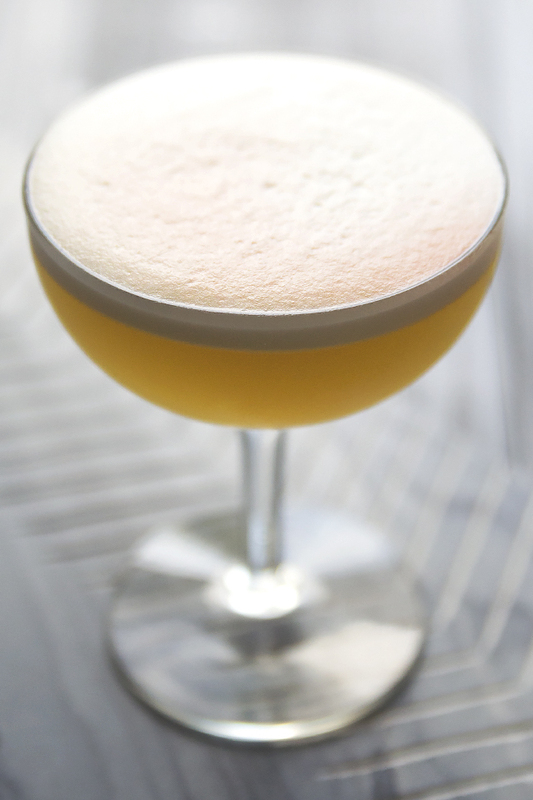 Smoky, salty, bacon-y pisco! Now you’re ready to mix your cocktail. 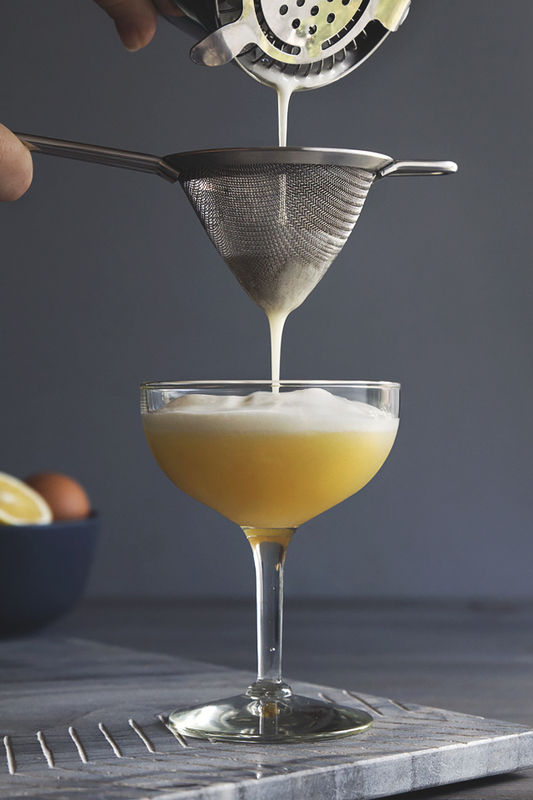 Add egg white, lemon juice and maple syrup to a shaker. Give those ingredients, and those ingredients alone (no ice) a dry shake for 10 seconds. 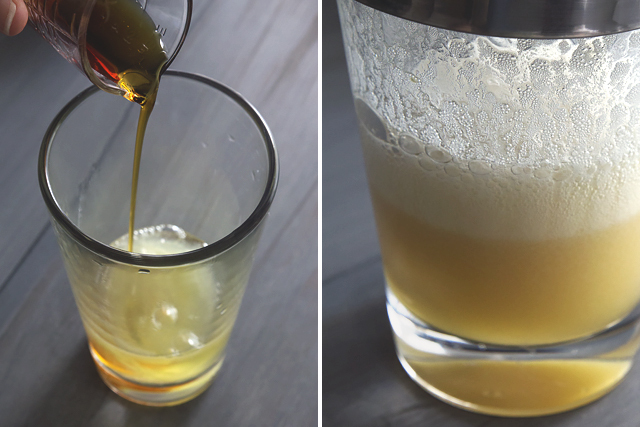 This will help your egg white get extra foamy. Next, fill your shaker with ice and add the bacon-infused pisco. Vigorously shake for 10 seconds then double strain into a chilled coupe glass. I was a bit worried that using a fat-washed spirit would kill my foamy egg white. If you’ve ever tried to make pavlovas, you may have learned that the hard way. But I was pleasantly surprised that I still achieved a thick frothy foam worthy of any pisco sour. Instead of garnishing with the usual drops of bitters, I gave the foam a very slight mist of bitters with my atomizer instead. And there you have it – a hearty breakfast and elegant cocktail all in one. Congratulations again to the lovely Jessica and her growing family. Cheers!! Cook 4-5 strips of bacon to render bacon fat. 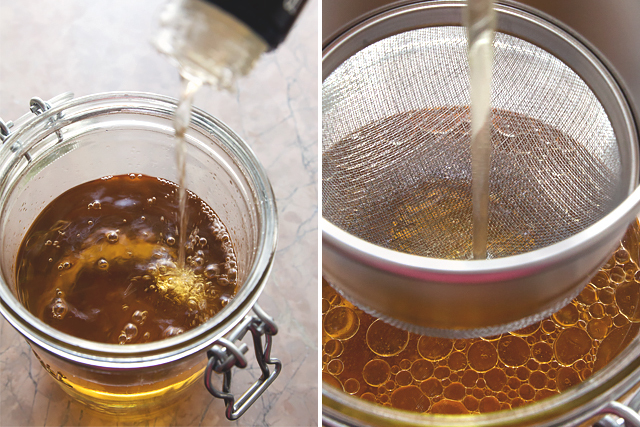 Pour liquid bacon fat through a fine mesh strainer into a heat proof glass jar and set aside to cool slightly. Transfer pisco to a freezer-safe widemouth jar. 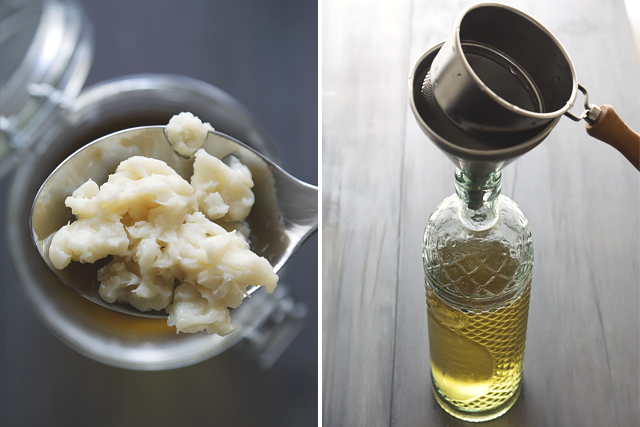 Strain the bacon fat into the jar of pisco. Place the pisco in the freezer for 24 hours. Remove the pisco from the freezer and skim the solidified bacon fat off the top. Funnel the pisco through a fine mesh strainer back into the bottle. Add egg white, lemon juice and maple syrup to a shaker. Dry shake without ice for 10 seconds. Next, fill your shaker with ice and add the bacon-infused pisco. Vigorously shake for 10 seconds. Garnish with a mist of Angostura bitters (optional). 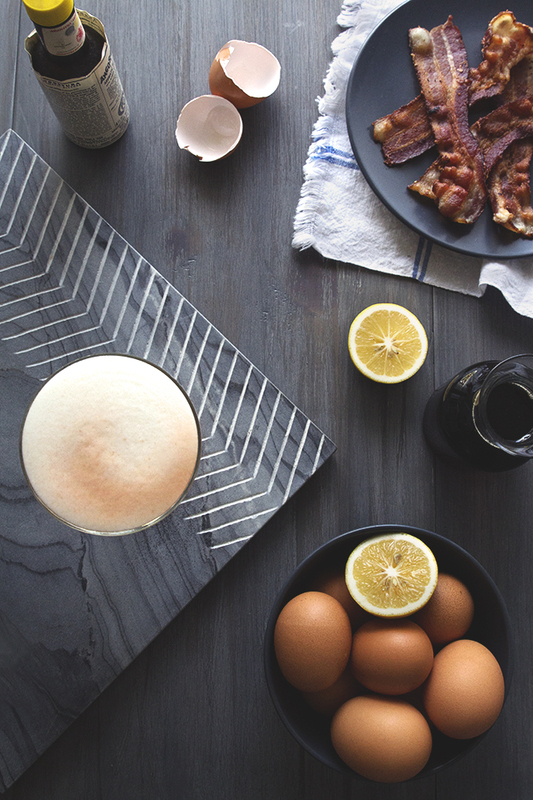 This maple bacon pisco sour looks absolutely fantastic. Beautiful photos, too. I look forward to trying this. Aww, thanks Bella! I should definitely revisit this one! Wow. These are amazing pictures. I love them, keep up the good work your’re doing here! Aww, thanks Zach! Really appreciate you stopping by the site! Gorgeous pictures. 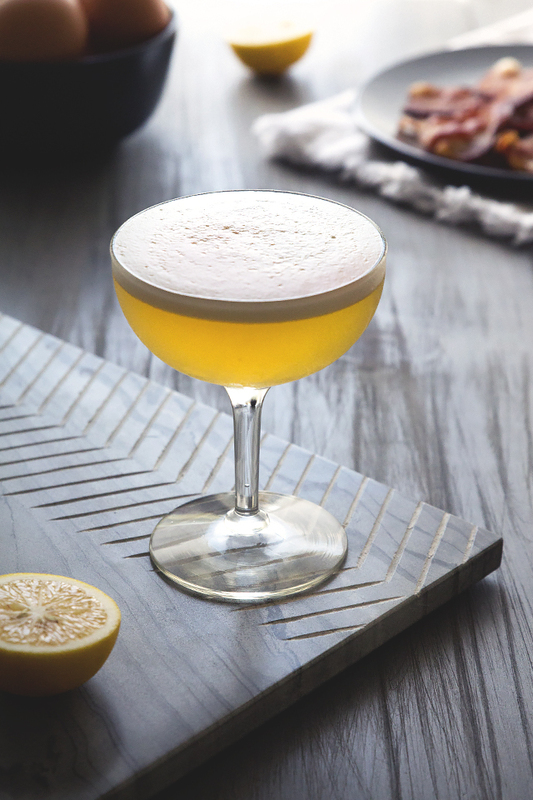 I made this maple bacon pisco sour for the super bowl party and it was a crowd favorite. I’m also gonna pin this post on my Pinterest board my followers will love it. Thanks for sharing, Todd! Oh My God Where did you get the cutting board? OMG!!! This cocktail is screaming my name i cannot wait to try it!!! Sour Recipe by HonestlyYUM < Loved it! This is insanely over the top and I love it. Sounds delectable! But I’m really dieing for that cutting board, where did you get it? Now that is a cocktail! Jessica is a lucky person. You guys have done a beautiful job with this “virtual” baby shower..
Wow, many congrats all around!! To you, to Jessica and to Bev who has the best instagram of twin babies ever, haha!! The recipe looks amazing Todd… bacon fat?! Holy smokes, I need to try this. Great job!!! This drink is INSANE. Fat-washing has to be the coolest name for a kitchen technique I’ve ever heard. I am so intrigued and enticed by this combo. Adore. Heck, yes. I am all over this! Let’s get that baby out of Jessica’s belly so she can have one of these STAT! YUM! This sounds delicious. 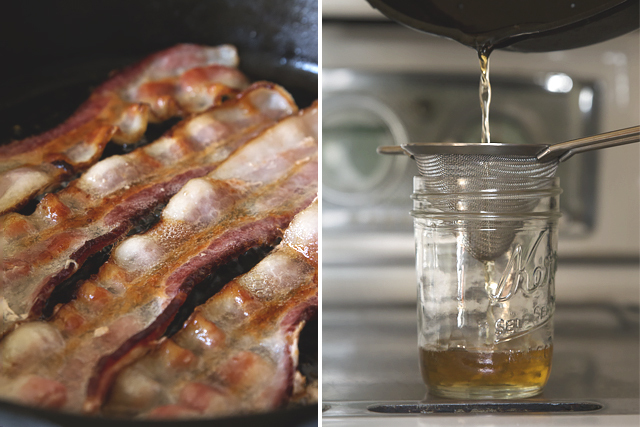 I made bacon-infused vodka this year and it was great (hello bloody mary’s!). I can’t wait to try this out!! Gosh, this looks sooooo good Todd!! You can’t go wrong with maple and bacon. Whoa, that’s one heckuva party! These cocktails are pretty beyond words – how do you do it?! My goodness! I’ll be running a race this coming weekend and I know exactly what I’ll be having post-race! I just happen to have some pisco in my liquor cabinet and, true to my Homer-name, there is always bacon in my ‘fridge. Really creative drink Todd. Thanks! I’m so glad you did pisco, because I am a pisco sour fan (ok, I love all booze). But this was WAY more creative than going with the traditional bacon-bourbon pairing. Very nicely done!!! i’ve never had a pisco sour…but i’m pretty sure i need to start with one made with bacon. Wow, that is quite the cocktail! Anything with bacon is fantastic. I’ll most definitely have to make this for my husband and I one night. Can’t wait to try! Thank you for sharing. Heather Christo – Eat Well, Live Free. Deliciously Allergy Free Recipes. Weekend Toast: Maple cocktail and mocktail recipes for fall. Confetti Cupcakes with Cake Batter Frosting for Three! : Best of Baking with Pinterest!